Maintains and enriches the cool tone directions. Detangles the hair and improves combability. Provides strength and moisture leaving the hair soft, healthy and shiny. Cool anti-yellow pigments: For colour enhancement and neutralisation. 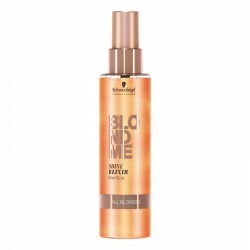 Delivers cool pigments to maintain, refresh and enrich blonde tone directions. Hydrolysed Silk: Hair conditioning agent derivate from silk. Improves the texture of delicate blondes. Contains moisturising Panthenol to balance the natural water content of the hair structure. UV-Filter: Helps to protect the hair from damaging UV rays. Comb through to evenly distribute. Can also be used for all other blonde hair types for soft neutralisation. Perfect tone maintenance for BLONDME tone directions Ice, Steel Blue or Lilac.